It was an exclusive lunch at a high-end Manhattan restaurant on 7 March 2011. United Nations Secretary-General Ban Ki-moon and his entire A-team were present. It soon became clear that the main item on the menu was Libya, where it was alleged that the forces of Muammar Gaddafi were rapidly advancing on the rebel stronghold of Benghazi to crush all opposition. Over an $80 per head lunch, a small group of the world's most important diplomats from countries represented on the Security Council discussed the possibility of the use of force, ostensibly to protect civilians, but in reality to effect regime change. As things turned out, the Council's authorization came only ten days later, and all hell broke loose. Hardeep Singh Puri, India's envoy to the UN at the time, now reveals the Council's whimsical decision-making and the ill-thought-out itch to intervene on the part of some of its permanent members. In contrast, on Syria-which too was unravelling at the same time-the Libyan experience and internal differences within the Council led to a complete policy paralysis. The result, made worse by the earlier intervention in Iraq, has been the biggest refugee crisis since World War II and the creation of the ISIS. 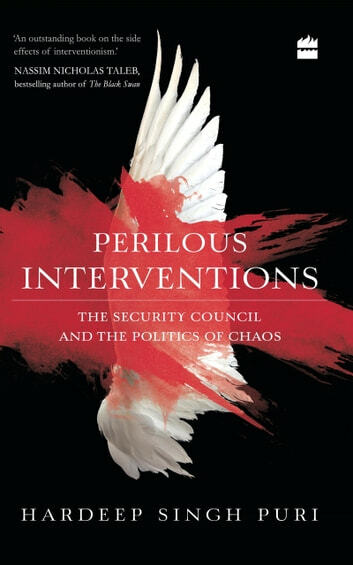 Perilous Interventions shows how some recent instances of the use of force-not just in Libya and Syria but also in Yemen and Crimea, as well as India's misadventure in Sri Lanka in the 1980s-have gone disastrously wrong. He focuses on the syndrome of intervening nations turning away from the scene once their vested interests have been achieved, as in the case of Iraq, where more than 100,000 civilians have died since the war began in 2003. He also highlights India's key role in warning against interventions and attempts at regime change. Treading the path of reason and caution, Perilous Interventions calls out world powers on their misdeeds and cries for a reform of the global political order.